For some time now, with the full support of cloud computing technologies, it has become possible for enterprises of all sizes to access new business opportunities, thus repositioning themselves in the global IT market. Advancements in cloud interoperability, with important developments of platform as a service (PaaS) and cloud management solutions, have enabled an increasing number of cloud services which, in turn, have led to additional requirements for integration at a superior level: the cloud governance. Moreover, current cloud migration patterns suggest that additional mechanisms in cloud services automation and management are required, in close relation with a fully automated support for the lifecycle of cloud services. 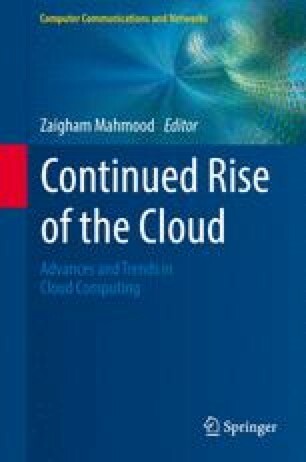 This chapter discusses existing trends in cloud migration focusing on solutions which facilitate it, with an emphasis on cloud management and cloud governance, and the relationship between them. This work was partially supported by the grants of the European Commission FP7-ICT-2009–5-256910 (mOSAIC) and FP7-ICT 2011–8-318484 (MODAClouds). The work of the second author was also partially supported by Romanian Government national grant PN-II-ID-PCE-2011–3-0260 (AMICAS). The views expressed in this chapter do not necessarily reflect those of the corresponding projects’ consortium members.